Should the church challenge Christian fundamentalism? This is a sensitive subject because the mainstream churches want to be tolerant and accepting of difference, but at the same time the activities of Christian fundamentalists impact negatively on mainstream Christianity. In many ways interaction with fundamentalist Christians is like interfaith dialogue because what they believe is very far from the historical beliefs of the Christian church. For example, fundamentalism tends to be unjust and confrontational which is quite different to most Christian’s understanding of the teachings and example of Jesus. Fundamentalist evangelical Christianity is a 19th century religious movement with its roots in the USA. It originates in a list of “fundamentals” of the faith which can be found here. Belief in the inerrancy and infallibility of scripture. The Bible is taken to be literal regardless of the genre of writing of the passage being read. Some fundamentalists hold that the Authorised Version of the bible is the only true preserved word of God. Belief in dispensationalism including the special place of Israel in God’s plans and the imminent return of Christ via the rapture. Growing adherence to Jewish festivals, Hebrew biblical names and dietary laws. Some fundamentalists are charismatic but some are cessationist. Great emphasis put on sexual morality (abstention before marriage and the condemnation of homosexuality). Lack of interest in “good works” except where they are likely to lead to new converts. Belief in young earth creationism. Rejection of ecumenism and sometimes even isolation fro other fundamentalist groups. Rejection of theological education and a detachment form church history and tradition. How big is the challenge of fundamentalism? As church attendance has fallen evangelicals and fundamentalists have become a larger part of what remains while still being of a similar numerical size to previously. The increase in Christian television channels has given fundamentalist ideas a wider platform and greater currency. There are currently 16 Christian channels on the Sky satellite TV platform and 14 of these hold strongly fundamentalist positions. Whilst there is anecdotal evidence of a decrease in the number of congregations within mainstream denominations who permit fundamentalist ideas the number of independent churches, especially in the west African immigrant communities, has increased. The collapse of the Christian Bretheren in the UK and their members assimilation into Baptist and Independant Evangelical churches has caused their theology to become more mainstream. Fundamentalist ideas are closely associated with the political right in the USA and they have mastered the use of the Internet to make their ideas appear more mainstream than they might otherwise be. Strong connection between popular conspiracy theories and similar theories put forward by well known fundamentalist writers and speakers (e.g. the secular anti Europe feelings and the wish to maintain the pound, and the fundamentalists being opposed to Europe because they see it as a recreation of the Holy Roman Empire). The Internet and Christian Television has allowed individual church members to be influenced by apparently persuasive arguments outside the community of their own church and the influence of a theologically trained minister. Declining church attendance has caused some churches to look at successful American churches and duplicate their methods and theology while funding from US based Christian organisations to UK based evangelical groups has encouraged them to become more open to the ideas of their benefactors. What is the nature of the challenge? Fundamentalist Christianity in the UK is quite small, but its influence greater than its size. One example of this is the promotion by fundamentalists of young earth creationism. Prior to 1990 in the UK this was not something given much prominence in conservative evangelical circles. It did exist in some of the smaller groups like the brethren but during the early 90’s it started to spread. “Creation Science” was said to be able to prove that God existed by proving the truth of the bible. The argument went like this: “if the bible is true about creation then it must be true about everything else therefore God exists”. It doesn’t take much examination to realise that that statement is illogical. Even if the creation story in Genesis was found to be compatible with observable facts this would not have any definitive bearing on the veracity of the rest of scripture. Not withstanding the illogicality of this argument the fundamentalists pushed ahead in the 1990’s and created the very hammer with which the new atheists would later attack the church. All the atheists had to do was reverse the argument: “If the creation story is proved to be false then the bible is not true and there is no God”. Another example is the blanket condemnation of homosexuality even though a literal reading of the bible’s references to homosexual acts show them to be only condemnatory in certain circumstances (e.g. if they are between people who do not have a homosexual nature or between teachers and pupils - something common in Greek culture of the time). The fundamentalist interpretation relies on a non literal interpretation of the texts in the original languages which is a strange reversal of the fundamentalists normal belief about biblical interpretation. In Christian fundamentalist ethics it often appears that the bible is used simply as a reinforcement of a previous moral zeitgeist rather than as a way of illuminating how people should treat each other. Why do mainstream churches seem to be avoiding the issue? It is very difficult for the mainstream church to enter this debate because it does not want to be seen as critical of other people’s faith, especially when that faith is superficially so similar to their own. There is also the risk that criticism by moderate church leaders would be seen as persecution by the fundamentalists. Fundamentalists view criticism as persecution and persecution is clear evidence to them that they are doing the right things. The more a fundamentalist is criticised the more they believe they are correct. Mainstream churches are also seeing some growth at their Conservative Evangelical fringes. Whilst these members are not fundamentalists there is reticence to be seen as critical of evangelical ideas which on their own are not necessarily harmful. Another reason for the lack of criticism is that an increasing number of fundamentalist churches are from the African immigrant community. There is a reticence to be seen as critical of them in case this is viewed as racial discrimination, imperialism or simply cultural insensitivity. How can mainstream churches address this? I have no simple answers, but I can see paths by which they could start addressing the issue. One option is for churches to treat Christian Fundamentalism as a different faith from mainstream Christianity and deal with it on an interfaith basis. This would allow it to be questioned and challenged while still retaining respect for the fundamentalist position. Previously its been quite easy for debate to turn into shouts of “fundie” which is something that does not happen in interfaith dialogue. Treating it as an interfaith issue would enshrine a respectful attitude. There also needs to be open debate within mainstream churches on the wider fundamentalist issue rather than the narrow hobby horses of science vs religion and ethical issues like homosexuality. The divide really originates from different understandings of the atonement and the purpose of the bible (rather than its textual mechanics). Discussions about these sort of issues might discourage the pull of some people away from an orthodox position towards fundamentalism. Christians need to get more involved in presenting their faith through online media. Not necessarily in debate or interaction, but in simple expressions of how their faith affects their lives. This has tended to be the monopoly of fundamentalist blogs and discussion boards. Look up any theological or biblical issue on a search engine and it will be mainly fundamentalist sites in the results. This balance needs to be redressed. Theological education is also an important factor and mainstream churches should encourage the education of the laity so they can explain their holistic understanding of the bible and gospel message. One method of doing this might be to run events and classes which are open to the wider public. This will be of benefit to the churches in their mission to the world as well as a defence against fundamentalism. I try not to get bogged down in debunking specific bits of evidence advanced by creationists because I think the real issue is not scientific or pseudo scientific flim flam, but whether Genesis 1-3 is poetic allegory or scientific history and whether Jesus understood it as either. However, something caught my attention during a broadcast on Revelation TV last Friday night featuring Dr Grady McMurtry. Those not familiar with Dr McMurtry might like to read my previous article about him. During the broadcast he was asked by a viewer for evidence that the earth was in the region of 7,000 years old. In reply he gave a list of examples of evidence including the case of a brass bell found inside a lump of coal which would be impossible if the coal was prehistoric. This is one of a number of evidencial claims which the largest creationist organisation Answers in Genesis lists as “to be avoided” due to lack of substantive evidence. The Answers in Genesis list (which can be viewed here) also includes other claims that Dr McMurtry has used in recent television broadcasts (including a pre flood canopy of water vapour surrounding the earth and the speed of light changing over time). That’s not to say that this Answers in Genesis not using these theories totally defeats his argument. After all they feel able to make the case for a young earth without using any of this questionable evidence. However, I think that using it does weaken his position as someone claiming to use a scientific approach to creation issues. Having had my interest sparked I decided to investigate the bell story and this is what I found. The bell was found in 1944 by a ten year old boy called Newton Anderson who dropped a lump of coal and found the bell inside. Mr Anderson kept the bell until 2007 when passed it to Genesis Park (a creationist web site run by Dave Woetzel). At this time he underwent polygraph tests to determine if he was telling the truth about the discovery of the bell and the result of this was that “no deception was detected”. The circumstances surrounding the discovery of the bell. The bell is made of brass (an alloy of copper and zinc) with traces of tin, arsenic, iodine and selenium. It is about seven inches tall and is mounted with a crudely described figure appearing to have one visible leg, two arms and a head. You can see detailed photographs of the bell here. What does the figure on the top represent? 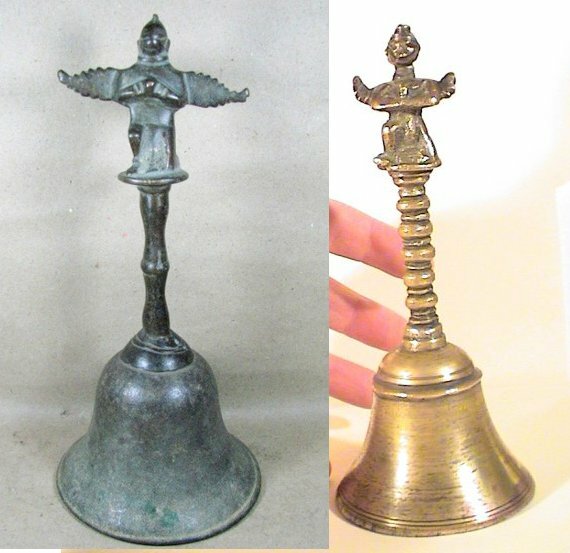 Newton Anderson himself spent some time investigating the bell and found similar bells bearing the figure of the Hindu deity Garuda. These bells are used in certain Hindu ceremonies including marriages. Here is a photograph of a Garuda bell. Now click here to see some detailed photographs of the bell found by Newton Anderson. The photograph above shows a black and white image of a garuda bell on the left and the bell found in coal on the right. If you compare the two you will see a number of similarities. Note the leg appearing out of the casting. Whats interesting about the bell found in coal is that rather than be a smooth complete casting the figure on the top has a large number of filing marks clearly visible on it. 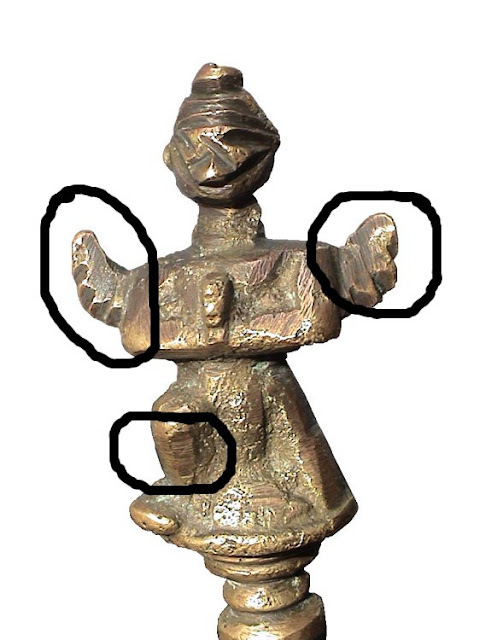 If the filed areas are compared to the same areas on a Garuda bell it can be seen that removing those areas from the Garuda bell would produce an artifact with a very similar appearance to the bell found by Newton Anderson. In my opinion the case put forward by supporters of the bell that it represents some demonic deity of pre flood times is not proven. It is more likely to have been made by obtaining a Garuda bell and removing material from it with a file. If the figure on the bell found in coal contained more material than the figure of Garuda (extra parts, wings or some other extremity) then it could not have started life as a Garuda bell. As it stands it is a distinct possibility that it did. As for it being a representation of a demon, I have not seen any depictions of demons which equate with this image so if we are to assess what it represents then the Hindu deity Garuda (or at least a modified version of it) seems to be the closest. Depictions of Garuda have changed through the years and the oldest ones I have seen have a more elaborate depiction. This might be a further indication that this is a recent object (less than 200 years old). It has been claimed that the bell is made of an alloy of brass which is different from any modern alloy. The claim is that a nuclear activation analysis was undertaken which revealed that the bell contained copper, zinc, tin, arsenic, iodine, and selenium. Copper and zinc are the main components of brass so they have to be present or it isn't brass. Copper and tin produces bronze and tin is sometimes added to brass to make it harder wearing (for use in bearings for example). Arsenic and Antimony are routinely added in tiny quantities to reduce corrosion, especially in brass used in ships. Further to this, although it is possible to buy off the shelf bars of brass a lot of casting work relies on melting down scrap brass. In fact brass is one of the most recycled metals due to the value of the copper it contains. In any business casting non mechanical wear items like ornaments and clothes fastenings there will be little concern about what brass scraps go into the mix other than their price. In my opinion the case that the alloy the bell is made from is unusual indicating some ancient origin is not proven. The presence of the additional metals actually indicates a recent manufacturing date not an ancient date, after the routine use of brass in ships and the discovery of the necessary additives. It is more likely that the brass started life as worn bearings and ship's fittings from a breakers yard, and that it was manufactured by an artisan in India or elsewhere in Asia in the hundred years preceding its discovery. What about the discovery of the bell in the coal? The arguments about the figure on top of the bell and the constitution of the brass do not, in my opinion, point to an ancient date for this artifact. However, if it was found in a lump of coal then that either means it was buried in a swamp with ancient trees and it became coal (without being distorted by the pressure), it was inserted into the block of coal later or it was present alongside the coal and only became visible when the piece of coal broke. All we have is the testimony of one person who says he found the bell when he was ten years old (over 60 years before he took the polygraph test). Polygraph tests are unreliable because they only tell us if someone thinks they are lying and there is no doubt that Mr Anderson believes he is telling the truth. Another intriguing possibility is that the bell appeared to be in coal but was actually in a concretion of coal slurry and coal lumps hardened over time so that it appeared to be inside a contiguous lump of coal. This theory is expounded in this article. Without documentary evidence from the time the story of the bell found in coal can not be taken as evidence for a young earth. Its just too far from what we know about geology and the artifact itself just doesn’t seem old enough. Earlier this week I mentioned that the God I don’t believe in probably does not exist. I think I need to expand on this a bit. Not just for the benefit of my regular readers, but because writing it down will give me the opportunity to reflect on it further and order my thoughts. To start with, its quite clear that I still lack belief in God and that lack of belief is very strong. My friend Nelu Balaj has pointed out during our various conversations that he does not believe in most of the things that I don’t believe in, but he still believes in God. His feeling is that the God I don’t believe in does not exist anyway, and that there is room for me to believe in God and still give the same weight to reason and the world we live in. Nelu’s background is in Romania where most of the post communist missionary work was done by American evangelical churches, and he has had a journey to adapt from that narrow approach to a wider belief about God. This gives him an openness to discussing things like this which is very helpful. Having had some time to reflect on our discussions I think that Nelu has a valid point and that rather than considering myself as a general unbeliever I should really define what I don’t believe in. As well as helping me it might also help other people having a similar experience of loss of faith or who have never been able to embrace the possibility of faith. So who exactly is the God that I don’t believe in? He is a limited God who only enters the lives of people who choose him. I have written previously about my dislike of the alpha course whose main message seems to be that life is pointless without God. Clearly it isn’t. Most of my friends do not acknowledge God in any way yet they have lives full of meaning, interest and - dare I say it - joy. This either means that God only enters the lives of the unhappy and dissatisfied or he is already acting in everyone’s lives regardless of whether they recognise it. He is a God who requires a decision to accept him rather than a decision to follow him. The disciples accepted an invitation from Jesus to “follow me” which implies a journey, but this God views faith as a destination rather than a journey. Once the convert has accepted God all things will come right provided they sufficiently exercise their faith. Try telling this to a poor person in a developing country where the resources available for change are very limited indeed, or to someone with mental health problems who can’t exercise faith as they are struggling to sustain their own sense of self worth. Real life teaches us that not all problems can be solved and not everything can be put right. The inevitable implication of this God of decision and faith is that if things don’t improve then he doesn’t care, has withdrawn, does not exist at all or that the believer has insufficient faith to conjure him up. Worse still, if someone has the misfortune to have insufficient mental faculties to make a decision then there is hope, but no certainty, that they are acceptable to God. This includes people with mental handicaps, young children and people with dementia. He is a God who has little time for people like these. He is a God who has favourites. He is vindictive, preferring his favourites at the expense of others whom he actively punishes in life and whom he will hold in eternal torment after death. His favourites vary from the Jews in the Old Testament to the true believers of today. He also favours certain believers by blessing them more than others. Yet the Jesus described in the New Testament regularly showed care towards people who would have been considered outsiders. The story of The Syrophoenician woman in Mark chapter 7 is one example that springs to mind here. He is a God who requires us to deny reason and accept things as fact which contradict our knowledge of the physical world and our experience of real life. The biggest example of this is the creationist doctrine, barely mentioned in Britain before 1990, but now a touchstone of evangelical orthodoxy. Yet, if God is our creator then he created reason too. It would be illogical for him to ask us to believe things which contradicted what we can clearly observe in his creation. 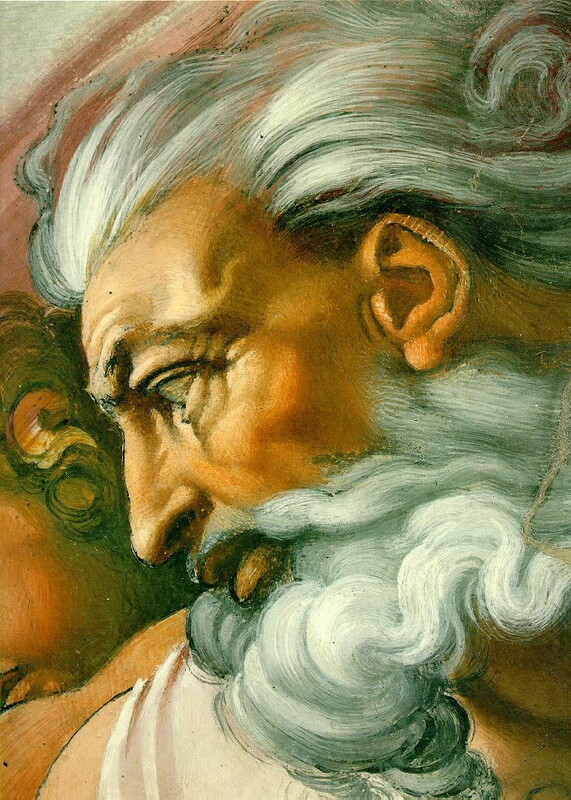 He is a God who does not like difficult questions. Rather than being open to examination we are asked to accept a fixed understanding of God through a literal interpretation of the Bible with no room for putting it in its historical or social context. If we disagree with something or don’t understand it this is due to our lack of understanding or enlightenment rather than the accepted understanding of it being wrong. He is a God of the individual. A very 21st century God who delivers on promises made to the individual without requiring anything from us as a community. Yes, he requires our individual worship, and he recognises a body of believers, but they are simply an assembly of individuals. He does not recognise that assembly as a community with a mission to the world or responsibilities to others, other than the need to make more converts. This itself usually manifests as individuals trying to convince other individuals, not as a community accumulating new members as it grows. He is a collector God. Having created every individual with a soul and free will he then needs to collect them all back in at the end of their physical life. Not only is this an unnatural separation of the spiritual and physical, but it also drives believers to evangelise by quantity through targeting those who are most likely to convert. Why is it that students, young people, the lonely and unhappy get targeted by churches? Does God love these people more, or is it just that they are more likely to convert and help balance the books of a collector God? He is a God of dubious morals. If the bible is to be accepted as the unadulterated, directly delivered word from God then it logically follows that God does not live by the same rules he expects us to live by. He regularly asks people to kill on his behalf, does bad things to people because of things their parents did, sends plagues on people who have not directly done anything to provoke it and generally seems to revel in his unbridled power. If this God was a person I knew in daily life I would avoid his company at all costs. He just isn’t my kind of person. He is a God of moving goalposts. As new believers we are given milk and as we grow we are fed new solid food doctrines. These may contradict what we were originally told, but our acceptability to God depends on us accepting them. In marketing this is known as “bait and switch”. Hook someone in with a simple message and then gradually add in the other things like creationism, dispensationalism, pentecostalism and any other number of novel ideas. So that is a partial description of the God I do not believe in. In regards to this God I am an atheist, not merely an agnostic. This will surprise a lot of my friends but last Sunday I went to church for the first time in three years. 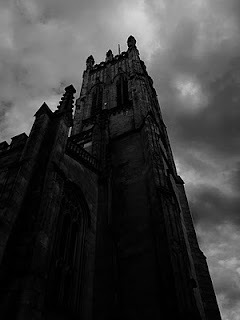 I had been thinking about it for a few weeks, but I didn't feel comfortable going to any of the local churches because I have a relationship with them through my work. Last week I passed by St John's Church in Princes Street and went in to have a look. I know the building very well having played the trumpet there for concerts, weddings and even a funeral, but I had never attended a service there, and not been there at all during the tenure of the current rector. During my visit I had a look at the leaflets on display in the vestibule and it was apparent from this that it was the sort of church that was used to visitors and where I could just pop in and sit at the back. This sowed the seed, and come Sunday I had decided to go. My one remaining concern was the liturgy. My only previous experience of an episcopal church was quite a high church where everything was in a general prayer book without the specific things for that week written in, so it was a huge relief that when I did turn up on Sunday that everything was printed in a booklet. Firstly because I could understand what was going on, but secondly because I did not feel under any pressure to "perform". My last church experience was in a pentecostal church where there was an expectation that you would express your faith at some stage during the service by speaking in tongues, shouting "amen! ", dancing or being generally exuberant. Even as a performer of music I couldn't really get into this style of worship. Maybe thats a wrong attitude in me, but I just didn't feel comfortable behaving like that and Sunday mornings are not when I am at my most lively anyway. The sermon was preached by the associate rector Rev Donald Reid and was on the parable of the good Samaritan. What I found refreshing was that he was honest about the failure of the church sometimes to help people in need and the marginalised, when I am used to hearing that the church does the right things but it is not understood and discriminated against by a world is full of sin. The other thing which stood out was that the sermon was not long enough to send me off to sleep. Previously I have been used to sermons that last 45 minutes or longer. This one must have been about 15 minutes long (although I did not actually feel the need to look at my watch). There was also no exhortation that we must all try harder in our Christian lives, which can be a strong theme in evangelical preaching. This is normally framed in terms of: Jesus did so much for you, what are you going to do in response in the way of donating money or time to the church? Maybe not as blatantly as that, but its usually a strong inference and it can be very difficult if you are already stretched to the limit by every day life. It was nice to not hear that sort of thing underlying a sermon. Overall I was left with the impression of Rev Reid's sermon that although I don't believe in God I could believe in HIS God. I did not take communion because I don't currently believe and I would not really know the correct procedure. Afterwards I stayed for coffee and was approached by another visitor who was most insistent that I should attend Charlotte Chapel because they teach from the whole bible with certainty. Maybe it was serendipidous that this person had approached me. I know the damage that that type of teaching has done to me in the past and I also know that my marital status would make attending such a church impossible. I also don't think that anyone is really totally certain about anything. They might claim to be, but faith is different from belief (as I wrote about recently). My impression of St John's Church was that it seems like the sort of place where there is space to think. A place where I could discover God without feeling the need to measure myself against an idealised standard of faith and where there was no need for absolute certainty. I will certainly be back as I found it a very positive, though challenging, experience. One of the problems I found with evangelical Christianity was that it sought to persuade people into belief by using forensic arguments. A case would be set out, just as it would be in a court, and an attempt made by the minister to prove that it was true using scripture, history and practical examples. If the case was then proved you were expected to assent to it or agree to it in faith. This, of course, is not truly believing something, its just assenting to it because you agree with the "prime directive" driving the community of believers you belong to which is the gospel. Its probably no coincidence that a lot of ministers in the Scottish Presbyterian tradition have law as their first degrees. The skills of legal argument are very useful in this type of setting. Belief, on the other hand, is truly knowing that something is the case, just as you can testify that grass is green and the sky is blue. Its not something which requires proof or acceptance. So if faith and belief are different things then does faith by its very nature include within it space for doubt? I think that it does. Certainty is a very difficult thing to pin down, and even the most ardent "bible believing" Christian has to acknowledge that they have agreed to doctrines that they do not truly believe with their whole hearts. Theology is a constant tension between doubt and certainty and if this tension was acknowledged more openly by evangelicals the church and the wider world might just be a slightly happier place. When I was 23 and attending traditional jazz concerts I was usually the youngest person in the audience. Now at the age of 43 and attending traditional jazz concerts I am still the youngest there. Its a sobering thought, but the audience for traditional jazz is not just ageing, its evaporating. A significant factor in this is the music not being embraced by the MOBO generation. Where they have embraced blues music, the jazz of Jelly Roll Morton, King Oliver and Louis Armstrong has been considered a white art form. The recent increased interest in jazz personified by Jamie Cullum has really been an increased interest in swing music which is why Robbie Williams and Michael Buble have been able to sell large numbers of albums. Its singers and big bands that are featured on the x-factor, not the songs of Bessie Smith or Louis Armstrong. At the same time the number of venues dedicated to Jazz has dwindled. In Edinburgh alone the Jazz Bar (mainly dedicated to mainstream and modern jazz) has closed and the Fairmile Inn (home to the Edinburgh Jazz Club) closed a few years ago. Even the Edinburgh Jazz Festival features mainly modern, bebop and mainstream jazz. Where does this leave traditional jazz? It still exists on record, but other than the original revivalists there is not much in the way of modern British recordings of small group New Orleans influenced Jazz. The bands that are managing to survive are ones that can play in a variety of styles or that can move into the Blues arena in order to stay in business, and they are staffed by musicians who are inevitably getting older. So is the writing on the wall? I sincerely hope not, but its hard to be hopeful under the circumstances.